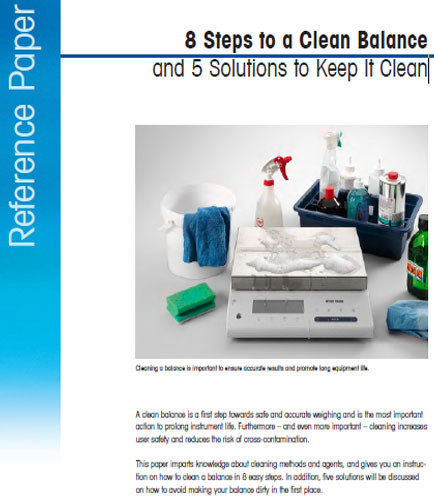 "8 Steps to a Clean Balance and 5 Solutions to Keep It Clean"
A clean work area leads to better results contributing to a healthier environment. Cleaning imparts a significant effect to both the operator safety as well as minimizing the risk of cross-contamination. A Clean Balance for your laboratory is a first step towards safe and accurate weighing results. It also helps in providing an enhanced shelf-life to your instrument. Engaging into cleaning procedures, not only increases operating reliability, but also, reduces equipment failure rates. Are my equipments well cleaned, sterilized, decontaminated, or disinfected? Are you using the appropriate cleaning agent for your instrument? What are the standard balance cleaning procedures to be taken? While it is important for researchers to choose the most appropriate type and volume range of pipettes, it is equally important to establish a regular pipette testing program to confirm that performance remains within the specified limits, supported by preventive maintenance and calibration if necessary. The more frequent pipette performance tests, the sooner defective pipettes will be detected and taken out of service, decreasing the risk of incorrect results and helping to minimize the need for corrective action. For assuring pipette performance, organizations have to follow essential requirements of a pipette care, maintenance plan, regulatory scheduled testing, and maintenance. What is the use of pipette maintenance? What is the impact of pipette performance testing? What is the future of pipette performance management and storage of pipettes? Move ahead and read the following white paper that will address all your questions, including these: What are the various types of pipettes? What are the best practices for pipette performance management and pipette performance assurance? What are the different testing, calibration, and preventive maintenance for pipettes? How to find a good service provider and manage the full service cycle?